The New York City Police Department is adamant about being the finest in the world, and so it’s more than willing to pick up other countries’ slack. 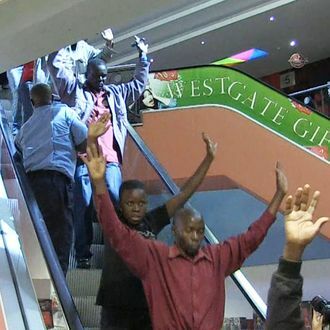 In the case of the September attack on Nairobi’s Westgate Mall, which killed more than 60 people and 6 soldiers, the NYPD is confident it has a better grasp on what happened than the country’s authorities: According to a report made public today, based on the work of two detectives in the country, only four people were responsible, they took no hostages, and they all got away. Officially, according to the Kenyan government, the siege was said to have lasted more than three days, and was carried out by between ten and fifteen people from the al Qaeda-affiliated group al Shabaab, four of whom were supposedly killed in the standoff. But the NYPD’s findings drastically alter that narrative, reporting that only four men quickly killed as many people as they could — “sparing some who could recite Muslim prayers or name the Prophet Mohammed’s mother,” NBC reports — before escaping just twelve hours later. In the remaining days, Kenyan police and military forces may have accidentally fired on one another and blown up a portion of the mall; “significant” evidence indicates they may have also looted the stores.